BRAVE reached our shores much maligned - a Pixar movie that was too Disney, too earnest, too mashed up in the re-writes, not funny enough, not adult enough..... And it's true, BRAVE isn't your standard issue Pixar fare. The protagonist is female, the setting is medieval Scotland, and instead of male bonding and pop-culture references we get an earnest, emotional and frightening film about maternal love and maturity. Princess Merida (Kelly Macdonald) rebels against her arranged marriage to a clan heir, refusing to be a demure feminine wife like her mother Elinor (Emma Thompson). Happening across a witch (Julie Walters) she unwittingly casts a spell that turns her mother into a bear - an animal her father Fergus (Billy Connolly) is most intent on killing. Moreover, if Merida can't undo the spell within two days her mother will remain a bear forever. I have to say that I was pleasantly surprised by the film, and it even got a little dusty in the theatre by the end of the movie. Maybe that's because I am a female reviewer, or maybe it's because if you approach the film with an open-mind: while it's different from Pixar classics, it's still a good relatable movie. I liked the voice work. I really believed in the reconciliation between mother and daughter and that the stakes were real. Moreover, on a technical level, the film once again pushes the envelope. Rural Scotland has never looked more lush. The scenes were Merida gallops through the countryside on her pony are just breathtaking. And as for her wild, curly, red hair - I am just stunned by the movement, texture and detail that the animators were able to render. I also loved the fact that the animation tips its hat to Studio Ghibli, with the witch-character and the will-o-the-wisps straight out of PRINCESS MONOKO or SPIRITED AWAY. Finally, let's not overlook the fact that for the first time ever we have a film with proper Scottish accents rather than Mike Myers painful imitation. 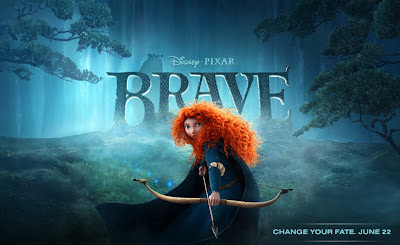 BRAVE was released in June in China, Australia, Malaysia, New Zealand, Russia, Ukraine, Canada, India, Indonesia, Taiwan and the USA. It was released in July in Pakistan, Vietnam, Argentina, Chile, Israel, Paraguay, Belgium, the Netherlands, Peru, Brazil, Colombia, Mexico and Japan. It was released earlier this August in France, the Philippines, Cambodia, Germany, Hungary, Bulgaria, Scotland, Ireland, Hong Kong, Singapore, Croatia, Iceland, Lithuania, Spain and Venezuela. It opened earlier this week in the UK and opens this weekend in Portugal, Romania and the Czech Republic. It opens later in August in Finland, Denmark, Norway and Sweden. It opens in September in Georgia, Italy, Serbia, Turkey, Panama, Slovenia and South Korea.